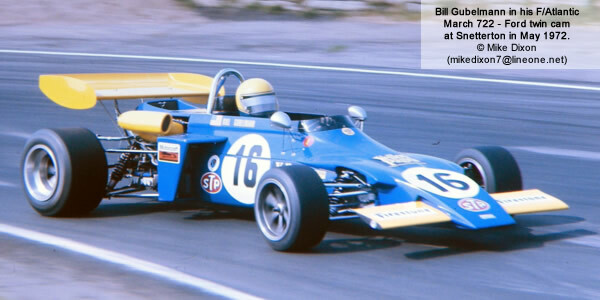 The 1972 Atlantic season started with grids of older machinery but Bill Gubelmann got his March 722 sorted and won two races. Reigning champion Vern Schuppan also acquired a March and 1971 runner-up Cyd Williams also got one to replace Graham Eden's 1971 Chevron. John Nicholson's Lyncar 002 was competitive but its unreliable replacement 003 dropped him out of contention. John Lepp's Chevron B20 and Mike Walker's works Ensign put in the odd competitive appearance and two Royales took pole positions but little else. With so many new cars, entries were often over-subscribed, a novelty for British racing at this time. The season turned into an epic battle battle between Williams and Gubelmann. After 19 races, with just two to go, Williams had won eight races to Gubelmann's four but the American had a string of second places to boost his points total. With a six-point lead and a new March 722, Williams looked odds-on but Gubelmann won the penultimate race from his rival and then pipped him again at the final race, by just 0.8s, to take the title. After the 1971 title had been won with a Ford twin-cam, BDA engines completely took over in 1972. However, there was a nasty and protracted controversy over the legality of these engines in the series, which led to Chris Meek winning at Snetterton on 7 May with a BDA engine everyone felt to be illegal, and being disqualified. Meek was sick of the interpretation of loose rules by other competitors, so deliberately flouted the regulations; his pole time was 1.2 seconds ahead of previous front-runner Gubelmann. Then at Mallory Park on 29 May and at Silverstone on 10 June Meek then turned up with a Ford twin cam back in his car, claiming it was the only legal engine in the field. The legitimacy of his original contention about the loose framing of the regulations was demonstrated when he was re-instated as Snetterton winner by an RAC tribunal. The other race was won by Clive Santo in his Palliser 'WDB4'. Four non-championship races are also included above, two won by Williams, one by Schuppan and one by Tom Pryce in the rarely-seen Royale RP12. Had there been a constructors' title, it would have been won comfortably by March, from Brabham, Chevron, Lyncar and Lotus. Points table from Autosport 26 October 1972 p6. The results here have been compiled by Chris Townsend using Autosport and Motoring News. Pat Sumner, who drove a converted F3 Kitchener throughout the season, supplied many invaluable organisers’ documents, including grid times and full results sheets. Not all the results are complete; results sheets or details of non-starters are needed for Oulton Park 18 Mar 1972, Silverstone 19 Mar 1972, Mallory Park 26 Mar 1972, Snetterton 31 Mar 1972, Brands Hatch 16 Apr 1972, Snetterton 7 May 1972, Mallory Park 29 May 1972, Silverstone 10 Jun 1972, Mallory Park 18 Jun 1972, Brands Hatch 25 Jun 1972, Oulton Park 22 Jul 1972, Brands Hatch 30 Jul 1972, Mallory Park 27 Aug 1972, Oulton Park 30 Sep 1972 and Brands Hatch 26 Dec 1972. The only entry list still needed is for Silverstone 28 Aug 1972. Grid sheets or details of qualifying are needed for Brands Hatch 5 Mar 1972, Oulton Park 18 Mar 1972, Silverstone 19 Mar 1972, Mallory Park 26 Mar 1972, Snetterton 31 Mar 1972, Snetterton 7 May 1972, Mallory Park 29 May 1972, Silverstone 10 Jun 1972, Oulton Park 22 Jul 1972, Brands Hatch 30 Jul 1972, Silverstone 28 Aug 1972, Brands Hatch 10 Sep 1972 and Brands Hatch 26 Dec 1972. Chassis identification is largely from details of previous owners of second-hand cars (typically F2 cars which have been identified from F2 reports), chassis plate observations by Adam Ferrington and others plus constructor chassis records for Chevron and Lotus. Palliser, GRD and Ensign production records may still exist somewhere and copies would be most welcome. More details of the Puma, Wimhurst, Dulon, Taydec, Kitchiner and Huron would also be very helpful.